Royal Hawaiian Club is a condominium community built on 8 Acres in the northeast part of Cape Coral in between US 41 and Pine Island Road. This is a large condo complex of 9 two story buildings housing 126 units. The buildings closer to Pondella Road were the first to be built in 1982, the rest followed in 1985. The units are all two bedrooms and mostly 2 baths with some units having 1 bath. Floor plans range from a low 800+ sq. ft. up to almost 1000 sq. ft. of living area. They all have screened in lanais to relax and enjoy the views and the wonderful SW Florida weather in this beautiful tropical retreat. Amenities include two heated swimming pools, BBQ grills and picnic gazebos for those great outdoor gatherings. There are rental restrictions that have to be observed. 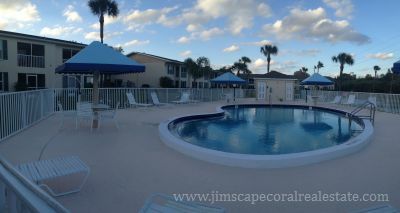 Maintenance fees are very low which makes this very affordable Florida living. Great location for a lot of restaurants being only 2 minutes away. Also nearby are a lot of services, Lowes, Target and BJ's are within a few minutes along with other retailers including Publix. Very affordable condo units that are rarely available and when they are, don't wait.